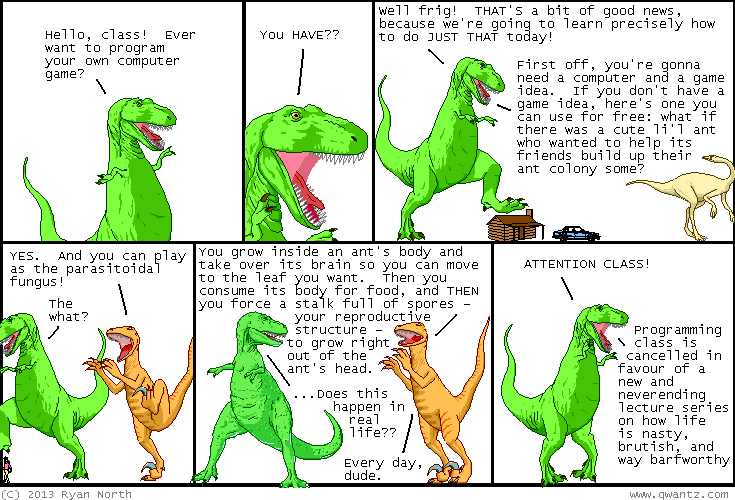 Dinosaur Comics - December 23rd, 2013 - awesome fun times! –The world revolves around me! December 23rd, 2013: Christmas is overmorrow!! If you're in Toronto and looking for a last-minute gift, The Beguiling (Bloor and Markham, by Honest Ed's) has a bunch of freshly-signed copies of To Be or Not To Be and The Midas Flesh! People will be all, "whoah, a thoughtful gift with a personal touch!!" and you can be all "um, OBVIOUSLY, OBVIOUSLY that is a thing I would give".